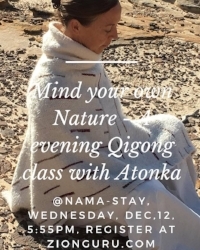 Join us for a rejuvenating evening at Nama-Stay and learn simple Qigong movements that helps sooth and rejuvenate the brain and your kidney - as we are just about to enter the Winter/Kidney season. We all know the brain is the seed of consciousness and that consciousness defines the essence of what it means to be human being. All of our emotions, thoughts, and actions are the result of our brain activities. When vital, its generated by a harmonious body, mind and spirit. With a healthy brain we are able to communicate through any life circumstance honestly and freely. In this practice we will learn how to provide the brain with a steady flow of "chi “ where a nice sense of rejuvenation can be gained. The purpose of this session is to help you become more sensitive to your brain, physically, energetically and spiritually to help enhance your overall health and vitality, reducing tension, brighten your nature, increase creativity and improve ability to interact harmoniously with a peaceful, divine mind within and without, that is innate in us ALL. This class is for everybody, including people who have never done Yoga, Qigong, or Meditation. It is Atonka’s wish to share a library of movements with you, to help build stamina, illumination and boundless love. Please park in town and walk to Nama-Stay. We have limited parking available. Wear comfortable clothing and bring your own Yoga mat. We will serve a nice Tea afterwards.